About…rather an all-encompassing word. This blog is About whatever happens to be interesting me at the moment. Panama. In May, 2009, I received residency status in Panama. I am currently house sitting in Potrerillos Arriba (of course there’s also an Abajo) about 3,000 feet above the city of David (Dah VEED) not far from the Costa Rican border. Boats, Ships and sailing upon the Sea. I grew up in Orleans on the elbow of Cape Cod and naturally developed a love of the sea. I also worked as a licensed captain for 18 years on yachts and small commercial craft, spent nearly three years on the French Riviera (Antibes) and sailed across the Atlantic in November 1991. In 1992 I bought a pretty little sailboat, a Kaiser26 that I named Nancy Dawson and took off for nine months and did a single-handed cruise from Fort Lauderdale to Mexico, Belize and the Rio Dulce in Guatemala and return. Music. I am a child of rock & roll. I love good old-fashioned honky-tonk, barrel-house piano and living in New Orleans I got to see some of the best ivory-ticklers in the business. Professor Longhair, Dr. John, James Booker, Allen Toussaint, Tuts Washington and one of my all time favorites…Marcia Ball. That’s what this blog will be about. Better known to you as Professor B. Worm, I just found about your new blog from Joyce’s blog. Scanning just briefly, I gotta lot of reading and catching up to do! I’m glad you’re aboard, Old Salt. Mucxh applause and congratulations for a blog well done! I’ve been a subscriber of Shanyboats for years, and have been planning exactly your type of retirement for a number of years. The location have changed now and then, but the liveaboard something more than a shack and less than a yacht is the core. My problem is that Social Insecurity tells me that I won’t, as yet, have an income over $1K/mo so going to Panama might not work. CR might work. There are a couple other places I’m considering too. Looking forward to each and every new post!! We also have a “Nancy Dawson” and spent 6 years cruising the Caribbean. She’s a 42′ Cheoy Lee Clipper, sitting on the hard in Florida since May. I think we feel the same way about our boat that you felt about your ND – we’ve come ashore and will miss her. She’s for sale. The old saying that the two happiest days in a sailor’s life is when he buys a boat and when he sells it isn’t necessarily true. It all depends on the boat. I was ecstatic the day I bought my Nancy Dawson and totally miserable the day I sold her. On the other hand, I also owned a wonderful Boston Whaler that I had for sale and I was so happy when she went out the driveway attached to someone else’s vehicle you can’t imagine the relief. That’s also the day I bought my one-way ticket to Panama. As you can see reading through the blog I’m living in the mountains here but I can see the Pacific Ocean from the front porch. I hope the sale of your boat goes smoothly. I have done medical mission and volunteer work in 11 countries since 1980 and am looking for a place to expat and do something usefukl in my old age. Would love to correspond or are you in any yahoo groups? I am in lowcostvoyaging and also some others. I’ve nominated you for the Liebster Award. There are no judges and no special rules, and no trophy, you were simply chosen. And we all like to be chosen every once in a while, don’t we? This award is what you want it to be. Your mission, if you chose to accept it, is to go to my blog post titled “The Liebster Award ~ Wow, it’s a little bit of work.”, read it, follow the rules and pass along the love. And who knows, you might have a little fun with it! I wasn’t sure where to post this, this was the only place I could find. I wanted to let you know how much I’m enjoying your blog. I’ve read up until August 2011 where you finally broke down and bought a Kindle. It made me laugh and I felt the need to let you know. My husband and I have our first trip to Panama planned for October 2014. He’s retired US Air Force, so we’ve lived in various places. We hope it will be a good fit for us. Thank you for such an entertaining, insightful and honest blog. Thanks for your kind words. I think you’ll find as you read further on, I really love my adopted country. You’ll find, if you keep reading, that I’m atypical of the expats here. I don’t have much to do with them Oh, I can count on one hand those that I do interact with, but even then not often in person. I guess I’m in total immersion here. In the little town I live in, Boqueron, I’m the only gringo in town. There are others in the outskirts, but just me in the town itself. And a Frenchman who I haven’t met. You’re still a year away from visiting Panama. You may find Boquete or Volcan to your liking, even if it’s not for me. Too many gringos in Boquete but they enjoy their socialization a great deal and there’s nothing wrong with that if you’re looking for that kind of thing. Volcan has a sizeable expat community, but, for me, it’s a bit too far out of the way from the things like diversity in shopping and access to medical care. October will be a good month to see if you can handle the place. It’s the rainiest month of the year. Very interesting blog. I love the sea but I know nothing about it. Don’t sail. Strictly on the dirt. Horse racing is my thing. But I love Panamanian tipico which i discovered accidentally watching a movie (The Tailor of Panama). Which led me to Samy and Sandra Sandoval and subsequently to your blog. You seem to be living THE LIFE. I’ll be watching. Oh yes, I do love boats especially old fashioned wooden boats. The only boats I’ve ever seen were featured in movies (Joe Versus the Volcano and others). So this blog seems rather serendipitous. If you ask me. Glad you enjoy the blog. I enjoy Panama. Right now I’m getting ready to hit the hay and, as I do every night, I tune in to a local radio station, CHT (Say Ahchey Tay) which plays tipica. On the weekends they broadcast live from around the area and tonight they’re over in Bugaba, about eight or nine miles west of the small town I live in. The entertainer tonight is a guy called Ulpiano Vergara. I’ve seen Samy and Sandra a couple of times at El Jardin El Cruce a click down the street a couple of times. Another tipica musician I like is Nenito Vargas. ship it to Panama, and spend maybe two months there each year for a couple of years at least. I need advice on where to keep the boat, local laws pertaining to live-aboards, etc. I would greatly appreciate it if you would give me such advice, and if you are willing to do so, an email address or phone number where I could reach you. I’m on a mission to reach the 10,000 Islands comin’ 640 miles so far from the St. Johns River to Naples, FL. It’s been a real adventure for me, and it ain’t over yet! I’ll always have one good adventure in me. Lee, sorry it took so long to respond to this. Inertia, don’t ya know. Anyway, been looking at your Facebook page and your blog. Lots of good time-wasting stuff there. Like your boat. Like your adventure. I’m in the process of modifying mine right now and trying to put it into a coherent fashion is extremely difficult and is one of the reasons I haven’t been here on the blog in the last few weeks, but it’s starting to come together. Sometime this week I hope to go see a couple of local boat builders and possibly see about getting a hull upon which to put up a shanty-type shelter. We’ll see. If you ever need any stuff hauling give me a call, I live in Tijeras just down the road from you so not out of my way, likewise if you need a lift & you can fit in with my schedule, know nothing about boats, I was a dairy farmer in the UK til I moved out here 14 years ago! In addition, I always try to get my blogs to the artists I write about but in this case, the ladies only occasionally perform and I could not track them down. So I decided to make a tribute page for them on FB. Eventually, several of the group joined up and they share lots of stories and memories. I didn’t see a field to leave a comment in on that particular post, so I’m leaving it for you here, in case you are interested. Cheers! Thanks for dropping in on my blog and taking the time to comment. I love those girls. The absolutely wiped out the Neville Brothers who are fantastic in their own right. I used to see them a lot when I lived in New Orleans, but the Mint Juleps won the night at that Juan les Pins fest. Mike – I like Shantyboatliving.com a lot and have corresponded with Bryan Lowe quite a bit. 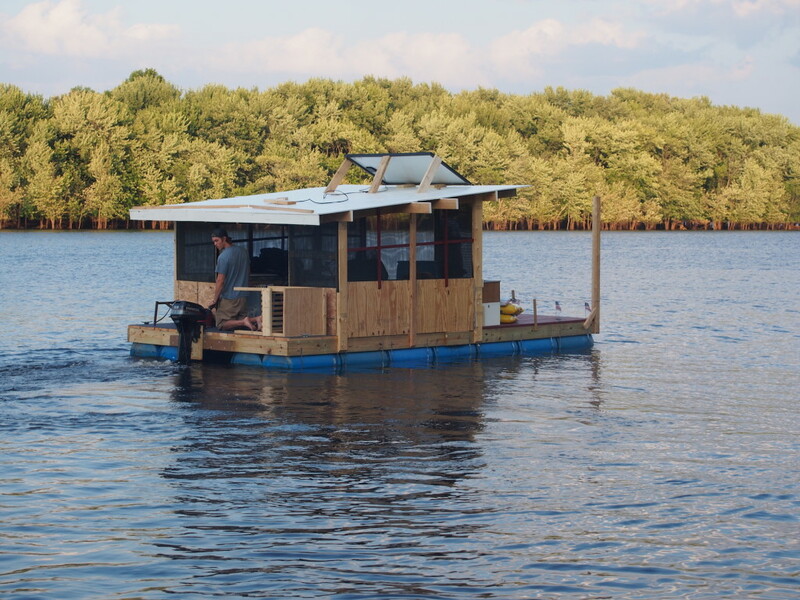 When I first started my shantyboat blog I went at it like crazy, but after a while when I’d Google to find more inspiration I discovered that I’d become a “source.” One nearly everything on the first three pages of returns were MY STORIES. So it’s trickled down a lot and I put what little effort I have into this Panama blog. I haven’t seen ANY shantyboats anywhere around here either in Bocas del Toro or Boca Chica/Brava area, the two best places to have one. I’ve written a book in Spanish and am in the process of translating it into English. Have you found that the bilingual format that you publish in has sold well? As part of a crowdfunding campaign, I offered a bilingual version. What has worked most well for you? I don’t know quite what possessed me to enter “Philbricks’s snack shack” into Google earlier. It’s hot season here in Bangkok, statistically the worlds hottest major city. I’m encapsulated in my apartment, AC grumbling of “Hi” and I was just kind of noodling…and suddenly I’m transported back more than 50 years. The wind on my balcony reminds me of the wind that used to blow through the open window on the parking lot end of “Philbrick’s Snack Shack”, to the left of the big, rectangular grill where I flipped hamburgers and butter grilled buns for two summers in the early 1960’s. Had the photo you posted had a little more depth, that might have been me behind the grill the day it was taken….guess I’ll never know. I can still see your dad, tall and rail thin, stooped over the fry prep area where he ruled the operation (except when your mom showed up, sometimes with you guys) shaking the excess of his special flour mixture off the clams and rings about to be dropped into the fryer. I remember my first day when he told me: “Eat all the clams you want! Feel free to eat anything here…except the lobster, for the lobster rolls…can’t touch that.” Smart man, your dad. After my first week, popping a sweet clam into my mouth every time I passed by the fryer, it was three years before I could eat a fried clam again. Dave Tullis, another summer staffer had introduced me to your mom the previous summer and she told me to get in touch the next spring which I did. Your parents had a knack, like successful sports coaches, of putting together great crews. We worked hard in crazy conditions but it was always light hearted and fun. Often, late in the afternoon on a early July weekend, customers would be stacked ten deep all trying to get their orders in and we in back would have so many burgers grilling that the fat would flood over the grill edges and splash on our fingers but we’d just plunge our hand into the always nearby frappe cup full of ice and keep flippin’. The girls in front were always cute and flirty…the best times being our frequent after work parties, back in the dunes, out of sight. Nobody told your mom about those. I can pretty much say the two summers I worked for your folks were the greatest summers of my life. My folks had a house on Herring Brook Rd. in Eastham, overlooking that beautiful salt marsh behind First Encounter Beach. We’d sit on our deck and watch Navy planes bomb and shoot rockets into the old Liberty Ship, permanently stranded on the shoals off Eastham and used as a target ship. It was especially dramatic at night when the aircraft would use searchlights and fire tracer rounds. You could see them ricochet off the water and back into the air. Do you remember that? Time went on, I went to college and other summer jobs. I was sad when your folks were forced out of the beach location. I used to go into the new restaurant when in town but it was never the same for me. Philbrick’s Snack Shack was very special place for many, many people, including me. Your mom and dad were special to work for, always letting you know what they expected and always fair. In later years when I had my own company, I tried to use the lessons they had taught me in dealing with my own employees. Wow! There are probably a few thousand folks that have worked at the “Shack” over the years. My folks, and then my brother Jeff, ran the place for 32 years. That’s a long run. I remember Dave Tullis AND the Longstreet. It’s gone, now, and the Bay looks deserted. I put in eight summers at the Shack and did absolutely everything there was to do there starting when I was 12 peeling onions and potatoes and washing pots and pans and mopping the floors. I worked eight hours a day, six days a week and got paid 25 cents and hour AND taxes were taken out of that! It’s been a long time since I was on the Cape. Last time was at LEAST ten years ago. I have no reason to go back. My brothers are living in North Carolina and Florida. Gary’s dead and his wife, a lovely lady, has moved from Yarmouth to Sandwich. I have a nephew and a niece who live around Brewster and Yarmouth, but I barely know them.